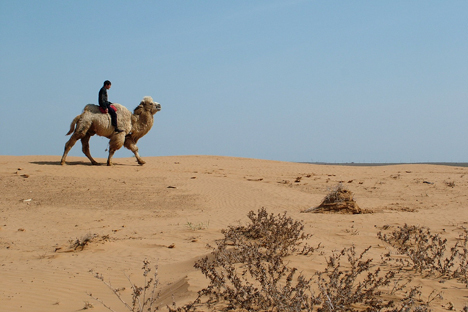 How wild camels live in Russia, the first Soviet rocket’s launch site, where to find the Golden Horde’s capital, and why Buddha cried in Russia. The steppes occupy an enormous territory on the map of Eurasia. These grasslands stretch from Manchuria to the Danube River Delta, and, in antiquity, they bore the name of the Great Steppe, across which the Great Silk Road once ran. The steppes, now known as the Eurasian Steppe, were home to various nomads — Scythians, Huns, Mongols, and many others who gave history the Mongol Empire founder Genghis Khan and the great conqueror Tamerlane. RBTH traveled to Astrakhan Region, on a sliver of the Great Steppe, where the descendants of the ancient conquerors live to this day. The steppes extend along the left bank of the Volga, through the entirety of the Astrakhan Region and up to the river’s outlet into the Caspian Sea. During the summer, temperatures can reach 50 degrees Celsius (122 degrees Fahrenheit), while the land consists of sun-scorched plains and occasional sand dunes stretching as far as the horizon. The largest of the dunes, Big Brother, ascends 65 feet above the landscape. The nomads were primarily concerned with raising cattle. While this is still the case in Astrakhan, the region’s people have settled into a more sedentary lifestyle. These isolated herding settlements, lacking electricity and running water, raise sheep, cattle, pedigree horses and camels. Locals are justifiably proud of two-humped “steppe-ships,” or Astrakhan Bactrian camels — and some of the largest in the world, at that. They are used today as they were thousands of years ago, to move goods. The steppes are inhabited by the descendants of the nomads — Kalmyks, Kazakhs, Nogais and Turkmens. Astrakhan is also populated by ethnic Russians and Cossacks, who make up the greater part of the population. Travelers who find themselves in the steppes of Astrakhan may come across shepherds riding burly Kabardin horses and driving several thousand flocks of sheep from pasture to pasture. They may also see wild camels, bands of horses, herds of saiga antelopes and packs of steppe wolves. Hunting season for the wolves is year-round, due to the considerable damage they do to local agriculture. They pose no threat to people, however, as the packs prefer to avoid humans. The steppes of Astrakhan have their own great enigma: the “Holy” Bogdo Mountain, which is the region’s only exception to the flat landscape, with its characteristic red hue speckled with numerous caves, grottos, cracks and ridges. Astrakhan or Volgograd can be reached by train or plane (about $155), car (about $45), or cruise ship. Major cities have auto rental agencies. All-inclusive tours (like this one) neglect the steppes of Astrakhan more often than not. You can book a special tour of the steppes (SagaTours agency, for example, has experience organizing such tours for foreigners, and prices for visiting the steppes start at only $400). According to ancient legend, two Buddhist pilgrims carried a stone on their shoulders from the Tian Shan (“Celestial Mountains” in Chinese) to Bogdo, where they dropped it. The stone forever became a place of worship for Buddhists from all over the world. The scientific explanation for Bogdo Mountain’s appearance in the middle of so many miles of flatland is based on... salt. The mountain is a rock-salt monolith. Covered by a lighter layer of rock, the salt is gradually rising, pushing most of the ancient rock (some 250–300 million years old) up through the earth’s surface. Bogdo is a true open-air museum; the first ancient amphibian and even shark fossils were discovered here in 1845, and the area surrounding the mountain is officially the Bogdo-Baskunchak Nature Preserve. The second jaw-breaking name of the preserve is Baskunchak, so called for the salt lake located at the foot of the mountain. Today, as much as 80 percent of Russia’s salt production begins at this extraordinarily pure lake (99.8 percent sodium chloride), from which Russia mines up to 1.5 million tons of salt annually. Salt was mined here as far back as during the days of the Great Silk Road. In the 20th century, the salt was hauled by camels; today, it is transported along the Baskunchak Railroad, which was built explicitly for that purpose. Local residents believe that Buddha once came to the mountain to mourn the pilgrims who had dropped the sacred stone there, and his tears formed the lake at the foot of the mountain. Baskunchak salt has therapeutic properties: There is a health resort on the lake shore. People come here to swim in the lake and breathe in the bromine- and phytoncide-rich air. Keep in mind: To get to Bogdo Mountain and Baskunchak, you will need to register for authorization for travel to the Russian-Kazakh border zone. It is extremely difficult for foreigners to do so on their own; we suggest using the services of a travel agent. The procedure will still take about two months, so plan your visit to the steppe in advance. Salt deposits lie 3.7 miles deep in the lake, which is known as the “second Dead Sea” for its therapeutic properties and its ability to keep even the most well-fed tourists in Russia afloat on the water’s surface. The first ballistic missile tested in the Soviet Union — the famous captured German V-2 — was launched from the Kapustin Yar launch site. Not long thereafter, this desert witnessed satellite launches, atomic bomb explosions, and a host of planes and helicopters bombarding its sandy plains with rockets and bombs. Not far from Kapustin Yar is the closed city of Znamensk (formerly Kapustin Yar-1). Lovers of the extreme can book a special tour of the former Soviet test site with local tour operators. Seven centuries before the emergence of tanks, Ghenghis Khan’s grandson, Batu Khan, returned in 1242 from his Western campaign. Having conquered half of Europe, he stayed on the Volga, where he had founded the Golden Horde’s capital, Sarai-Batu, 50 miles north of modern-day Astrakhan. In 1395, the city fell to the onslaught of the great Central Asian conqueror Tamerlane. It remained buried underground until the 18th century, when scholars began to study the unique site, which we also suggest visiting. Built for the 2012 film, “The Horde,” scenery that re-creates the atmosphere of the ancient capital was never dismantled, at the request of local residents. The stage-prop Sarai-Batu continues to delight tourists’ eyes. With trophy catfish, carp, asps and perch abounding, the banks of the Volga are a favorite destination for anglers from all over Russia. If you do not manage to go fishing, buying smoked and fresh fish from the locals is a must. Astrakhan is also famous for its watermelons, whose in-season (August–September) price falls to as little as four rubles (around $.12) per kilogram. You can watch the lotuses blooming in the Volga Delta as well.